Hard to believe, but it’s been one year since The Register Citizen launched a “Newsroom Cafe” and invited its audience to be involved at every step in the process of local journalism. 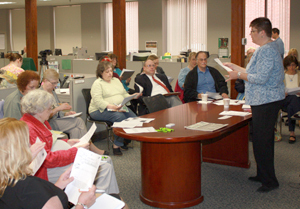 Managing Editor Emily M. Olson leads a workshop for local organizations and church groups on how to get information published by The Register Citizen. – Openness improves your journalism, leading to new and more diverse sources and improving accuracy and context. – Partnerships make you stronger. As Andy Carvin said recently, it’s not about “leveraging your audience.” It’s about listening and knowing how the audience is telling its own story, and in some ways acting as a facilitator as the community organizes itself around common interests or goals. If you feel that you must own and control every piece of content and platform for delivery, you will wither and die in isolation from the networked world. – Effective community engagement won’t happen on your terms, it will happen on the audience’s terms. Their lives don’t revolve around your internal process or desire to get a story done. But the power of the crowd can be amazing when you’ve tapped into something that citizens care deeply about and are either already organizing around or have been waiting for a platform to organize around. Readers (for the most part) aren’t going to tune in to the live stream of your daily story meeting because they care about what you talk about every day. They’re going to tune in because they know you’ll be discussing a particular issue that affects their neighborhood, workplace or family. Or the ideal – they’ll tune in because they feel welcomed to bring up that issue to you because you HAVEN’T been discussing it and they think you should. – The logistics of community engagement deserve a dedicated staff position (or positions), but it’s a principle that must be incorporated into everything we do and taken up by everyone in the newsroom. – “Just do it” should be the mantra given the urgent need to transform our business model and how quickly things around us change. But we need to spend more time along the way communicating internally and making sure that every employee understands and buys in to the underlying principles of openness and engagement. You can be undermined pretty quickly by staff who are just going through the motions. We invited the public to an open forum about online story comments at the New Haven Public Library last night, and we came away with some powerful arguments for community engagement and transparency. The turnout was small – four people in attendance with more watching video on our website and participating in a live chat – but the feedback was powerful. Yvonne Manning-Jones of Hamden said that racist comments on the New Haven Register’s website have changed how she views the community. She wonders if the waiter serving her at a local restaurant, or the co-worker who sits next to her, could be one of these people anonymously saying these things. Do they look at the color of her skin and assume she is on welfare, or a criminal? Marianne Carolla makes a point to Regional Editor Matt DeRienzo during a public forum on the Register's online comments policy held at the New Free Public Library Thursday evening. Manning-Jones has been so outraged by the nature of comments on the site – and how long the newspaper has allowed them to continue – that she has started copying examples and pasting them to her Facebook page, asking her friends whether they should be supporting any business that provides a platform for this with their advertising or home delivery subscription. Absent a dialogue between editors and the audience about it, a perception has developed that the New Haven Register at the very least didn’t care enough about the racist comments to do something about it, and at worst actually endorsed them. If that’s not the case, Manning-Jones asked, why are they present on the Register’s website and not on the online news site the New Haven Independent? We spent a lot of time at last night’s meeting talking about the ideal of story comments being a constructive public forum that improves and supplements our journalism and helps the community sort through important public policy issues. 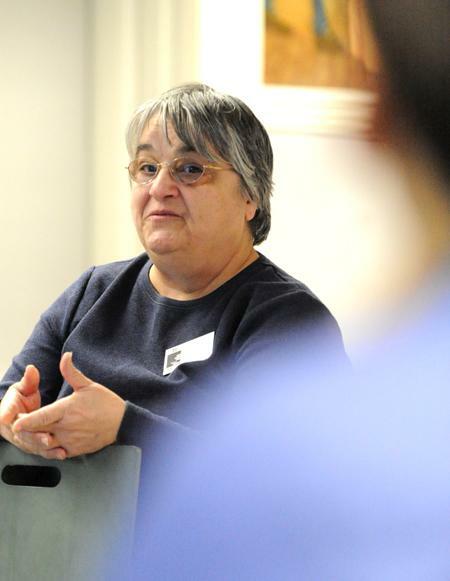 So another wake-up call came when West Haven resident Marianne Carolla spoke. She take on story comments wasn’t about offensive things being posted, or about the Register going too far in “censoring” readers. Carolla spoke about a forum that a New Haven Register reporter covered where a public official made statements, and then a group of citizens spoke at length with an opposing viewpoint. The story that was published contained only the public official’s side of the conversation, she said, even though the reporter interviewed citizens present and heard their testimony. Carolla said she did not use our online story comments to weigh in on the topic that day because she felt the “deck was stacked” against her. Rather than the open invitation that the newsroom perceives story comments to be, this reader’s perception of bias in our reporting and editing conjured a door that was slammed shut. Was that reporter biased? Did they screw up the coverage of that event? Maybe, or maybe the citizen testimony she was referring to was not central to the topic the reporter was there to cover. Or maybe the reporter had half an hour to write the story before deadline. Meeting Carolla reinforced my belief in the “Fact Check” box we have placed at the bottom of every story, and our recent launch of a blog that handles corrections more transparently and explains how we’ve handled Fact Check reports. We can build trust the more we invite them into the process and the more we show readers “how the sausage is made” by being transparent about our reporting and editing process. That could include opening our story meetings to the public, like we do at The Register Citizen Newsroom Cafe, or by sharing the list of stories we’re working on each day. Most of the errors made in journalism are sins of omission. Missing context, the “more to the story.” Readers who know there’s more to the story can see bias or incompetence in those omissions when the fact is that reporters and editors don’t know about or have access to all the potential sources and angles of a topic. Opening the process and engaging with the community can both improve that journalism and build trust. CLICK HERE for video of last night’s forum. UPDATE: New Haven Register Managing Editor Mark Brackenbury makes an important point in the comments below. I write about missing context being the most common error we make in our reporting, and this post is missing a key piece of context about the New Haven Register’s story comment system. For a long time – several years, actually – newsroom staff have felt strongly that the story comment system needed to change, for exactly the reasons spelled out by Yvonne Manning-Jones and more. Former New Haven Register Editor Jack Kramer pushed for this change, more than once, but it was either held up or blocked elsewhere in the structure of the company. Or they couldn’t agree on a plan to implement the change. Or something. Understandably, some newsroom employees read my blog post as saying that the system wasn’t changed because they are white and didn’t care enough about racist comments to make the change. I’d be upset at that suggestion, too, if I had been fighting to get it changed for two years. I was not intending to say that the 97 percent white newsroom didn’t want the racist story comments dealt with – they clearly did, from the top editor on down. I was saying that the absence of more people of color on the staff and in the leadership of the newsroom failed to provide the impetus to get it done. Impetus that would have overcome company structure and decision-making process. Lack of newsroom diversity affects what we do in ways that we don’t realize. It’s a topic that deserves a lot more attention, and I’ll publish a separate post devoted to this topic soon. UPDATE #2: I wrote a separate post about the question of newsroom diversity. It’s here.